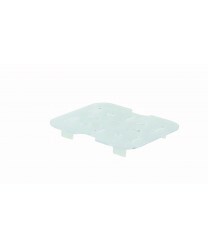 Keep pan juices, excess oil and other liquids away from food with the Winco SP76DS Poly-Ware 1/6 Size Drain Shelf for 1/6 Size Food Pan. The polycarbonate drain shelf will lift and support food in your sixth-size food pan, allowing liquids that might affect food quality to drain through. The drain shelf is NSF-certified, and it is built to survive the rigors of commercial food prep, so it will perform well in busy restaurants, hotels and catered settings.